Riddles in the Dark: Smeagol is Back! We're sorry that the short blogger makes it wait so long. She gets busy with "independent variableses" and "anacrusises" and her own blog. But we are going to keep posting! For the summer, we likes our posting schedule, but we changes it now. We tries to post once a week, yes precious? And we does different types of posts? Some of the same, yes, but some new! It will like it, yes, we thinks it will like it very much. Another post, we has another post coming! And soon we make some changes on the "Dear Gollum" page. Maybe answer questions there? Not wait for posts? We thinks about it. But before we goes, we has a joke! What does it call a fish with no eyeses? Well, I am looking forward to more posts whatever they be about, they have all been excellent! 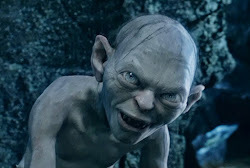 I am not entirely what to do about the Dear Gollum posts though, maybe just have short posts answering questions and one other post that week about anything that you want to write about. That's a good idea, and then...yes, very good idea. Ooh yeah, ok thanks!